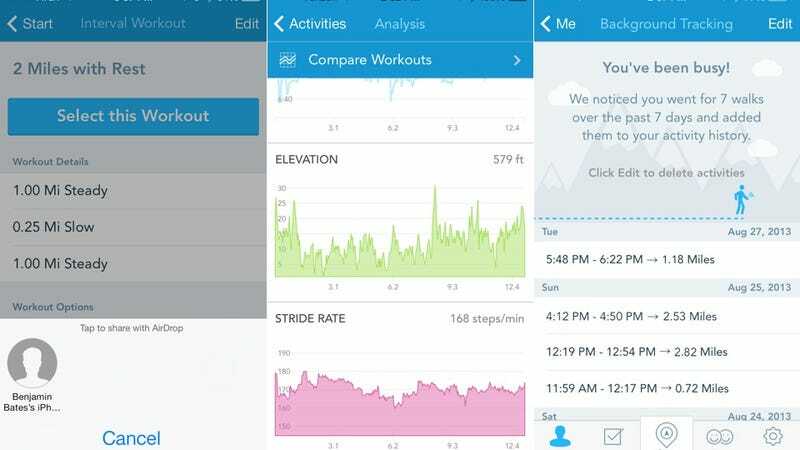 RunKeeper is one of our favorite techy ways to track your athletic activity. The app's latest update, out today, harnesses the power of the M7 chip to turn your iPhone 5S into an always-watching fitness tracker. Like a personal trainer named Siri. Taking advantage of the M7's always-on tracking, RunKeeper 4.1 adds a Pocket Track mode that, when enabled, automatically recording 15-minute-or-longer walks. At the end of the day, you'll be able to see the distance and duration of your jaunts — never let a spontaneous stroll go un-tallied! A new AirDrop sharing functions let you follow friends' RunTracker activity or share workout plans, while a stride rate chart now displays cadence alongside elevation and pace. The updated app is available today on iTunes.